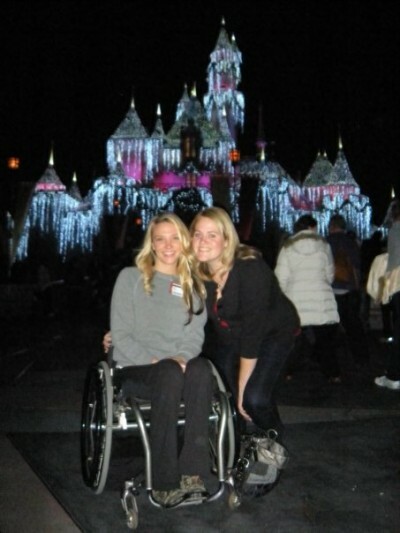 Disneyland- This is my friend Nicole and I at Disneyland around christmas time, it was such a beautiful sight. 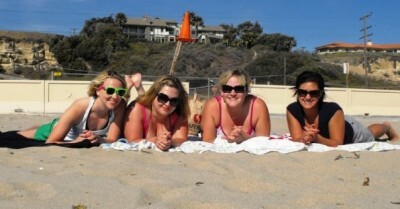 Malibu Beach- Nicole, Audrey and Me are all in the program and frequently we go to the beach and relax. Sometimes we bring homework, and sometimes we ban it from being allowed. But we always have a fun time. 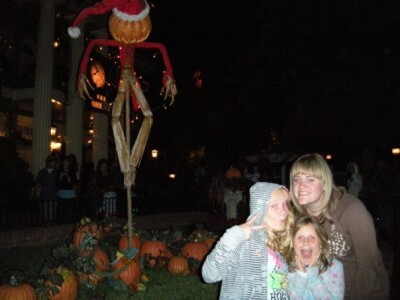 The Pumpkin Patch- I went with my cousins who live in orange county, it’s a really fun time. They have kiddie rides and kettle corn and usually some sort of live entertainment. Oktoberfest- In Huntington Beach this is an opportunity to be full emerged in Germany culture and tradition in the month of October. They have a band that they fly in from germany for the whole month and authentic cuisine and beverages. Camping- We went camping in Santa Barbara but there are several locations around LA that aren’t as far. It’s a cheap and fun way to have some friendly bonding and time with the outdoors. Hiking- There are tons of hikes around the LA area. Griffith Park is a location that is near the hollywood hills that many people choose to hike. 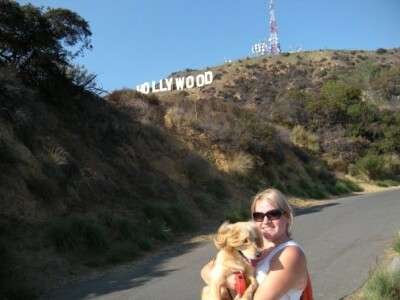 There is even a hike that will lead you to the hollywood sign. Restaurants- LA has some great restaurants to choose from, like this one that is an old fire house in downtown that got converted. 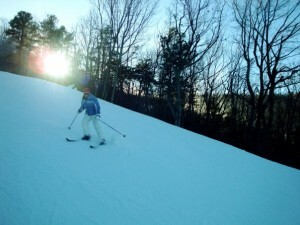 Skiing- Big Bear Lake is only about 2- 3 hours away and it is a great place to go skiing. It also has many activities to do when it’s not the winter time. 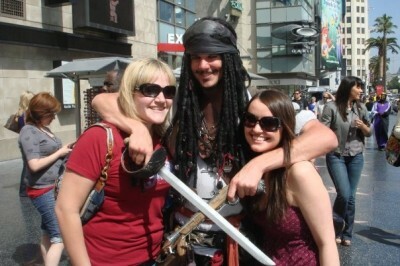 Hollywood Blvd- There is always a fun pretender to see and take a picture with on this historic walkway. Here is me and Johnny Depp. I hope this helps convince you all of everything that LA has to offer, comment on this post if you know of other great activities that I didn’t list. As we’re nearing the end of our OT school journey, I can’t believe we’ll be graduating so soon — I have mixed feelings of excitement to be done, sadness to leave the comfort of student life, and anxiety about where I’ll end up in the future. I can just remember when I was in the process of applying to OT school and deciding where to go, when I had my weekly email and phone conversations with Sarah Kelly to ask her my list of questions and help with the decision process! It’s definitely true that time sure flies by when you’re having fun! Lately, I’ve been thinking about all the amazing times I’ve had at USC in the past couple years. So, for my next few blogs, I thought I would take you back through my experience as an OT student at USC! 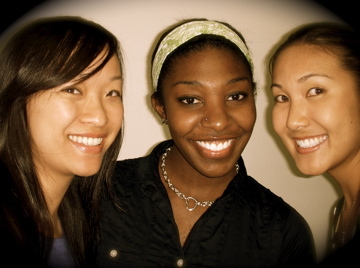 First, we start with the summer of 2008 when we were immersed in what it really meant to be a full-time student! We didn’t know if we were going to make it out of the summer still being able to think and function during our fall semester classes, but of course, it was completely fine! As we were lined up to go into the auditorium, I’m sure everyone remembers the first people they befriended! For me, it was Wendy and Miriam! Although it was a lot of studying, we definitely found time to have fun too! We love celebrating birthdays! 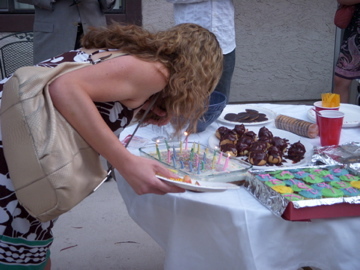 Here’s Tina blowing out her candles at the Wine & Dine event hosted by the OT House. 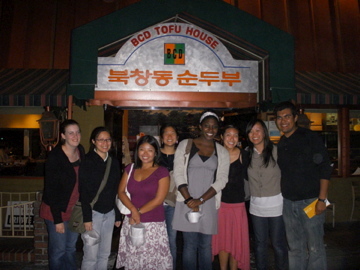 And this is a group picture from Miriam’s birthday — we went to a modern-day play of Shakespeare’s Taming of the Shrew and ate at the Tofu House in Korea Town! We also had fun in Dr. Fazio’s Skills class, which worked out to be the perfect stress reliever from Kinesiology and Neuroscience! 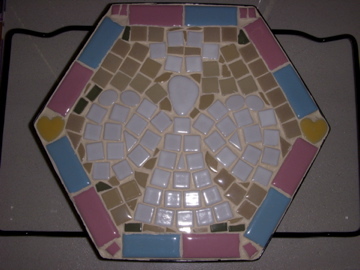 Here’s an angel pot holder that I made from ceramic tiles and grout — probably one of my favorite pieces! And who knew Neuroscience could be fun too (sorry, Myka — she’s another Student Ambassador who was a Neuroscience major)?! 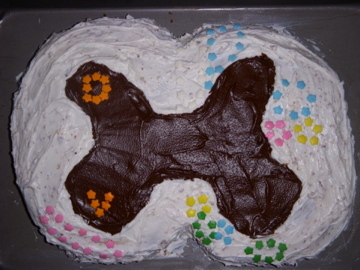 At the end of the summer, I brought in a cake that was in the shape of spinal bone, marking a few of the tracts that ran through it. A little nerdy, I know, but I always think there’s some way to incorporate food into your projects—it just makes it more fun for everyone! In OT school, we don’t focus on the diagnosis or the lesion, we focus on the client’s goals and dreams- and help them make stories to succeed! During undergrad, majoring in neuroscience, I didn’t think too much about the lived experience of what I was learning about. I was too busy figuring out where the lesion in the brain was, or discussing the philosophy of mind, or understanding abnormal psychology. The first summer of the Master’s program here at USC we take a neuroscience foundation course, and I thought I would be an expert and be familiar with all the material. I was excited to learn that many guest speakers had been invited to really talk to us about their lived experience with different neurological disorders or injuries. This was an aspect I had missed out on during undergrad. I learned that in OT, we don’t focus on the diagnosis or the location of the lesion or injury- we look at function and goals. When our clients are having difficulty doing the things they need and want to do, we work with them to fulfill their goals and live their lives to the fullest! One of my favorite speakers was a girl not much younger than me, Allison, who has cerebral palsy. She talked to us about living with this disability which looks different on the outside, but she is a typical college student. Well, I shouldn’t say typical. She writes screenplays and is hoping to transfer to USC. She is also a stand-up comic, performing all around Los Angeles. She actually just won first place in the qualifying round at a comedy contest! I’m friends with her on Facebook, so can keep up with her there. I thought of her today because I met with the current neuroscience professor for the undergraduate OT program and told her about our guest speakers, and got in touch with Allison so that she could come speak to that class. She replied that she would love to come. When Allison spoke to us, she had good advice for us future OTs. She told us to assume competence, and that OTs need to work with their clients’ goals in mind, not their own goals for the clients. Having these guest speakers in our neuroscience class really opened my eyes to what I would do as a future OT. I had thought about going to medical school, and enjoyed taking tests in college that were very clinical and diagnostic. But what I really wanted to do was help people individually, and understand each person as a unique individual with goals and dreams. Elizabeth Yerxa, one of the founders of Occupational Science and former chair of USC OT, said: “Medicine is concerned with preserving life; occupational therapy is concerned with the quality of the life preserved.” I know that in this profession I will be able to change lives for the better and am so excited for my future career!